We’re homing in. It looks like news reports placing the slick “about 2 miles southeast of Baptiste Collette [Bayou]” were a bit misleading. 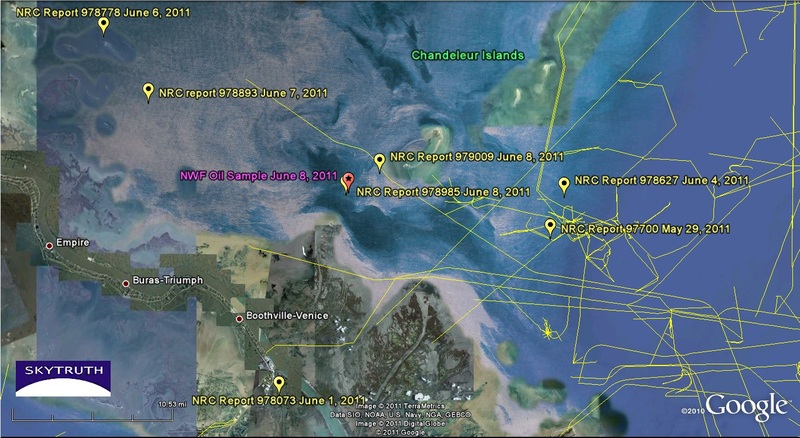 NRC report 978985 filed on June 8 contains that same description, but also a precise latitude/longitude location that actually places it 2 miles north-northeast of the mouth of the bayou, about 4 miles west-southwest of the southern tip of the Chandeleur Islands (Breton National Wildlife Refuge). 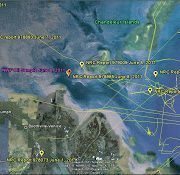 Our Gulf Monitoring Consortium partners, SouthWings, conducted an overflight of the area this afternoon with a passenger from Gulf Restoration Network, using the coordinates we provided. 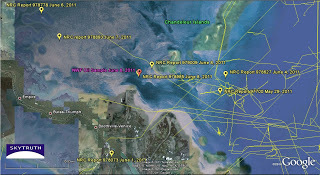 They observed a small slick in the same location as NRC report 978985 and NWF sample. GRN will be blogging and posting the pics shortly. Even more interesting: they encountered a TFR (Temporary Flight Restriction) zone over the area. The SouthWings pilot was permitted to enter, and tells us that unmanned aerial drones (UAVs) were operating in the area. Cool! Hopefully the Coast Guard is using those drones, which means they are really upping their game and bringing some high-tech tools into oil spill investigation. We hope that’s the case. If so: polluters beware. It’s getting a lot tougher to hide what you do.